Dorset Women's Week - programme launched! Dorset Women’s Week – programme launched! WAND is thrilled to launch the Programme for Dorset Women’s Week! Running from 5 to 12 March it is in celebration of International Women’s Day on 8 March 2016. The week begins with a performance from Rosemary Hawthorne – aka the Knicker Lady! Rosemary, much loved actress, fashion historian and author, will be bringing her famous collection of knickers – and other things to the Brownsword Hall in Poundbury (Dorchester) on Saturday the 5th March from 7.30pm-9.30pm. Tickets at £12 are available here. Other Dorset Women’s Week activities include: the opportunity to visit the Dorset History Centre and discover some surprising stories of women who have lived and worked in Dorset. You are also invited to a friendly evening session at the Winterbourne Hospital when you can get free advice and information on a range of women’s health issues. Or you could attend an empowering workshop to build your body confidence, join a stress busting workshop and learn techniques to manage your stress levels. Perhaps you would like to learn how to craft a beautiful necklace or spend an afternoon watching the film Suffragette. WAND also encourage you to join in with a very relaxing yoga class, attend a talk to hear the reflections of a female chief constable or join a unique session where you can develop your assertiveness skills through working with horses. If music is more your thing there is an inspiring concert programmed with singer-song writer Magdalena Atkinson. Plus you could take part in an uplifting guided nature walk with the RSPB or participate in some really super sports and leisure activities in Gillingham, Portland or Sherborne. 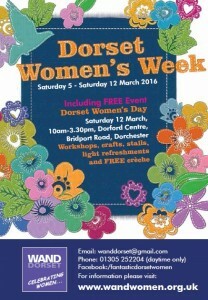 Dorset Women’s Week culminates with the 11th annual Dorset Women’s Day to be hosted by WAND! This will take place at the Dorford Centre Dorchester on Saturday 12 March from 10am – 3.30pm. Regular attenders of the event will know that it offers something for everyone and this year is no exception. The day will be packed with a varied and exciting range of workshops and including: photography, crochet, mindfulness, jewellery making, laughter yoga, painting, singing and card making. Plus Gabriela Lerner, established Raw Food Nutrition and Health Coach will introduce you to the amazing health benefits of raw food and how you can easily integrate raw food into your diet. A highlight for this year is that the esteemed author and broadcaster, Kate Adie who became a familiar figure to viewers through her work as BBC Chief News Correspondent, will be giving a talk entitled “A correspondent’s life”. Kate will share with her audience insights into her career, including how she came into journalism and key and historic moments she has faced. Reserve a place at Kate Adie’s talk here. There will also be a range of stallholders promoting everything relating to womanhood with the opportunity to find some wonderful hand made items. And following the success of last year, the RUMMAGE ROOM is back again! This is an opportunity for people to donate any unwanted woman’s clothes, accessorises and books (all clean and in good condition) and pick up something new to you. Proceeds will go to WAND to support other events. WAND patron Tracey West – broadcaster and author says “as a proud Patron of WAND You have no idea how excited I am that this year’s Dorset Women’s Day is upon us. In recent months, I have been personally reminded of how hard it can be to dust yourself down from a painful past and to find your mojo again. Rising up above a difficult situation that you are seemingly unable to influence, is exhausting – I am sure our special guest this year, Kate Adie, will testify to that – but rise up above it you must. Dorset Women’s Week offers a crash course on precisely how to do it. You need a sprinkling of uplifting friends and sisterly support, you need creative projects and free workshops to immerse yourself in and kindred spirits within your circle who will not judge you. You need a boost to your self esteem and to believe in yourself again – get involved in Dorset Women’s Week and feast on the positive energy that surrounds it! I look forward to seeing you there”. 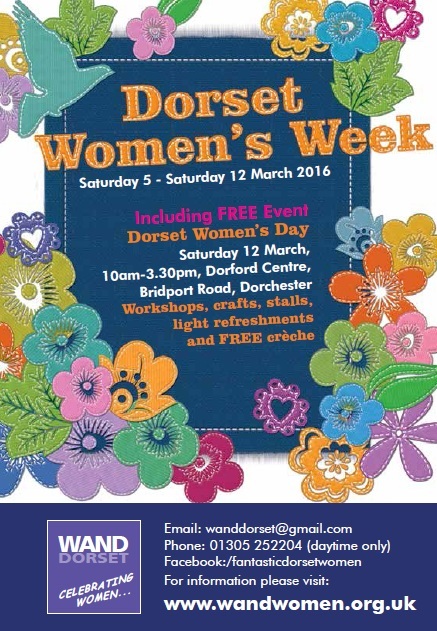 Admission to Dorset Women’s Day is free and is open to women of all ages and backgrounds. Free crèche facilities will be available together with the opportunity to purchase delicious home-made cakes and refreshments lovingly prepared by WAND volunteers. For full details of Dorset Women’s Week activities please check the Programme and contact the organisers directly. All details correct at time of press but may be subject to change. This entry was posted in Event, Uncategorized and tagged Dorset Women's Week, Knicker Lady, Women's Day on February 13, 2016 by mariac.